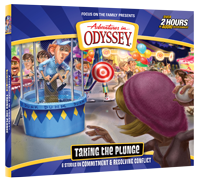 Promotion has begun for the 59th release of the popular Adventures in Odyssey audio drama. With nearly 800 episodes to choose from in the series, Focus on the Family has always been known for their generosity in sharing free episodes. In fact, the first episode in the newest collection, Taking the Plunge, is now available as a free download. The episode First Things First kicks off the album and picks up where the 58th album leaves fans hanging. You can download the free episode at this link provided by Focus on the Family. There you can also donate to Focus on the Family at any amount and receive a copy of the CD album when it becomes available. Alternatively, you can also download this and other free episodes at our Free Episodes page. Learn more about Taking the Plunge and reserve your copy now. You can also visit our 2015 Episodes page to see episode summaries and other details about each episode.